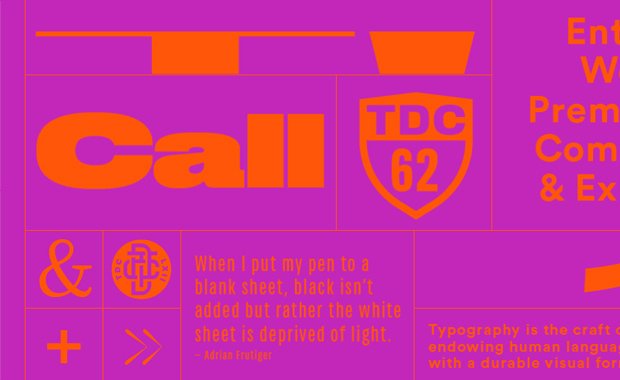 The Type Directors Club (TDC) has opened submission for its 62nd (2016) annual Communication Design Competition, the most highly respected and selective competition of the typographic and typeface design from around the world. Eligible for entry are original graphic design works with a typographic focus. Print and digital works that incorporate type or lettering are perfect for this competition. Entries selected by the jury will receive Certificates of Typographic Excellence. They will be exhibited in the 62nd TDC Exhibition, and appear in Typography 37. The Competition is open to professionals and students for works, from around the world, produced or published during 2015. Entry fees for TDC Members start from $60 (US) for single entries, $90 (US) for series entries. Higher entry fees apply for Non-members and late fees apply for entries after 11th December 2015. Discounts are available during the Early Bird registration period, until 12 Midnight EDT, 30th October 2015.